Have you driven a 1988 Holden Commodore? Displaying all 7 1988 Holden Commodore reviews. Really Good! — love the car got it really cheap! really good on fuel handles really well!! just atm the transmission is playing up ever since it recently got serviced! hopefully its only just the wrong transmission fluid! it keeps slipping at the momment! Vl — it is a friends car, and has been lowerd and the wheels are 19" or 20" so the ride is HARSH. becoz of the wheels being so big the speedo dose not work coz the speedo runs off the drive shaft. the car is still fun to drive it has a bit of power! but its hevy and there is at least 2" of dead zone in the stiring witch is a shame, being an 80s car the brakes are not very good and its very easy to lock them up. there is a lot of mods that can be done witch is good. it would be a good car for some one who likes fixing things up, and has at least a basic mechaniccal knoledge. Coste Of Fuel — i like it, its ver very loud (you hear me be4 you see me lol)its ok at the min. the new ones going to fly it should (with a bit of luck) beat a couple of serton cars lol. but the biggest killer is the coste of fuel i hate it. 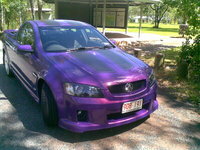 Awesome For Drag Racing, But Makes Me Look Like A Wog Princess! — I probably would have never bought a vl, because I don't like the impression that comes with them, but she's a hand-me-down from Dave. This car is the best $1000 I've ever spent, the torque in it is amazing for a 20 year old car, and the steering is super light. My only complaint is the amount of fuel I go through and the mysterious noise coming from the muffler. I also love the exhaust on this car, everyone knows when I've arrived, hee hee. Pros: It no longer has the factory engine, it is now powered by a Toyota 1JZ-GTE 2.5L Twin Turbo.100% increase in power. My Favorite Car Of All Time (holden Wise At Least) — I had a non turbo version.....so it wasn't a fast car... but she looked the goods. Those pop up lights are a nice touch!! Cons: Mine was stolen....... well it is a gorgeous car! !